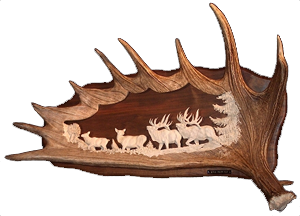 Experience the drama and beauty of the wilderness and wild west created by Monte Baker in each Antler Carving Art. Welcome to Monte Baker Antler, where we infuse the beauty of the outdoors with a piece of the animals that make up the great outdoors. 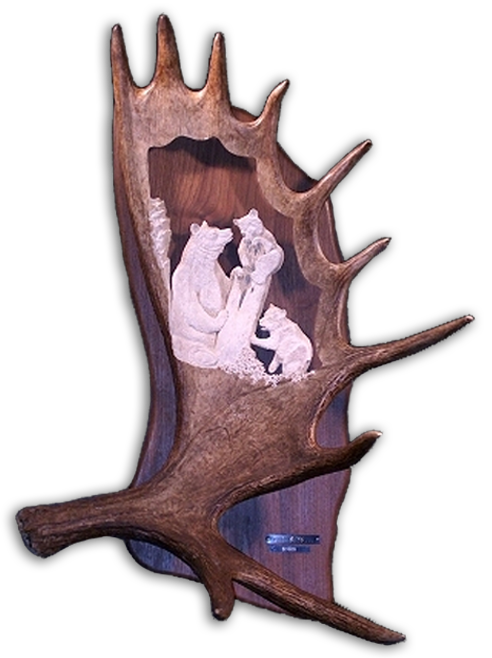 All of our unique Antler Carvings are the finest homemade western decor available and are sure to be the centerpiece of any room in your home or business. You can feel the excitement and drama with each of our Antler Carvings or piece of western decor that will last a lifetime. 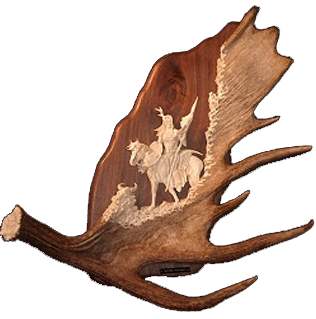 Experience the drama and beauty of the wilderness and wild west created by Monte Baker in each Antler Carving Art. Listen to the wolf howl, feel the winds blow, or hear the musical pitch of an elk bugle as if you were standing there, watching it happen. Each piece of Antler Carving Artwork captures such emotions and life that every viewer is drawn into the action. The dramatic shape alone of each antler brings an atmosphere and touch of “Mother Nature” that perfectly frames the superbly detailed subject matter. With over thirty years experience in developing antler carving skills and the antler art, Monte is certainly one of the World’s finest. Each Antler Carving, whether small or large, is designed to take advantage of the antler’s free form allowing the abstract shape to become part of the subject matter. Monte takes advantage of every opportunity to make the subject matter “come to life”. Monte exhibits at various art and gift shows around the country where his works are considered by many to be “best of show”. Frequent comments are heard such as “breath taking”, “awesome”, “incredible”, “the best I’ve ever seen” or just “WOW!” Take a closer look yourself, they’re worth it, see and enjoy! With being one of the finest carvers in the world, each one of Monte Bakers pieces are absolutely breathe taking and will never be duplicated. Located in the heart of rural Wyoming, Monte Baker has always been inspired by the settings and excitement that the great outdoors has to offer. We strive to capture that essence in every Antler Carving we have for sale. A lifetime of exploring woods, mountains and plains has been transferred into the finest Homemade Antler Artwork. 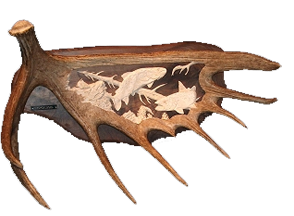 Most of Monte Bakers carvings come from Moose and Deer Antlers that are collected through exploring inspirational journeys or from hunters and fellow outdoor enthusiasts. 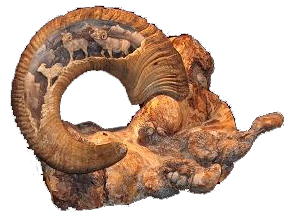 Each antler or horn that is selected to be hand carved resembles the image that Monte Baker has experienced or imagined. Over 30 years of memories and adventures of a person born into the outdoors are put into every single Antler Carving for Sale. Visit our galleries to view our moose, deer or elk antlers, shed antlers, homemade western and Wild West decor and ornaments. Thank you for visiting our website. Please take a few moments and see the one of a kind antler carving that has made Monte Baker world renowned. Whether you are looking to add a conversation piece to your living room or put the final touch to your wildlife trophy room, Monte Baker has the perfect carving for you. Please visit our website and gallery frequently to see the works of art created by the master craftsman, Monte Baker. Monte Baker has the perfect carving for you. Please feel free to contact me if you have any questions about my work.